In what must have been a ouija-like prediction of the present political effort to efface Thomas Jefferson’s role in America from Texas school books, it examines American fervor as well as the American penchant for war, for plenty, and for discrimination. The pinnacle of American righteousness may have been the rising up in indignation of churches to confront racist bigotry that murdered civil rights workers, bombed churches, and perpetuated a separate and very unequal view of a loving Christian religion. That, however, is not the episode on which Shama dwells. He mentions it more in passing as a bridge between the foundation of the colonies as religious experiments and the foundation of chillingly familiar twenty-first century mega-institutions designed for profits rather than prophets. Jerking us back to lessons lightly mentioned in high school, Schama reminds us that the Massachusetts Colony did not embrace religious freedom but, rather, imposed a stern government that required people not only to belong to a single brand of Christianity but criminalized and banned those such as Roger Williams who were guilty of believing that ‘noe person in the said colonye at any tyme shall bee any wyse molested, punished, disquieted, or called into question for any differences in matters of religion…’ Massachusetts’ intolerance for calling into question its tenets of religion continued well past the American Revolution: its constitution, drafted by John Adams, required that in order to preserve good government ‘the bodies politic will make suitable provision for the support and maintenance of public Protestant teachers.’ Catholics and Jews needed not apply, and ‘Mahometans’ were not even considered. There was compulsory church attendance, whippings, pillories, even the gallows for those who strayed. Schama begins with these stern freedoms of religion, compares them with Jefferson’s draft of the Virginia Constitution that assures separation of legislsation from religion, and notes that itinerant preachers from the South began to widen the pool of theology in a wave that continued through the Civil War and the Ku Klax Klan’s religious brotherhood of domestic terrorists. And, then, he builds on America’s religious history to generate seven-thousand member congregations with landing strips, escalators, Viking range kitchens, and political messages on cable television that demand a chance to write legislation and ban unbelievers as rigidly as Governor Winthrop did four hundred years ago. And this is just the chapter on American fervor. In just such a way does Schama obliterate the dull model of books of history as monotones of never-ending wars, depressions, elections, dates, names, and checklists. He instead reminds, indeed proves, that history happens on the individual level, that events affect real people rather than serving as tick marks on history exam. Among his models are Montgomery Meigs and his ancestors. A Meigs has served the United States since at least the West Point class of 1833. The first Montgomery Meigs, like all West Point graduates, was a civil engineer, a man of science who built canals, dams, and roads for the burgeoning American expansion, and who was taught enough of fortifications and ballistics to defend in time of war. When Meigs became quartermaster of the Union, his West Point cadet-superior Jefferson Davis presided over the Confederacy and his classmate Robert E. Lee led its Army. Meigs’s brother-in-law held the same post for the South, against him. Thus was this house divided, a division that was no less personal than the bitter enmity that has placed America in two camps today. In the same way, Schama shows that history is what happen to real people, farmers, builders of towns, people who educated their children and tamed much of the early Georgia countryside. However, they were not considered Americans; they were called ‘Cherokees,’ unwanted minorities to be driven away by a president and real estate magnates who wanted their land, landless itinerants forced to a barren and unknown patch we now call Oklahoma. It would be too much to touch on all, or even a tenth, of Schama’s history of us. It is enough to say that The American Future is the finest overview of American history written in many decades. He writes across disciplines such as history and religion, across periods such as Colonial America and the 2008 elections, and across agendas – Schama points a very fair finger at we who are heirs to plundered lands and unethical riches while making it clear that he believes in the American people as a race with a unique capacity to forge solutions from brutal discord. 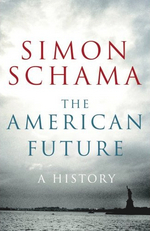 And why ‘The American Future?’ Every historian knows, and Schama is very much a historian, that the best way to repeat history is to ignore it. The American Future: A History, (20), Ecco/Harper Collins, www.HachetteBookGroup.com, $29.99. Comments and opinions expressed in Jack London Reviews do not necessarily reflect the views or opinions of the author or publisher of any work reviewed. Jack Woodville London may be contacted at jack@jackwlondon.com. Follow his commentary about historical literature, World War II, and related subjects at Jack London Reviews.